Thank you so much for your lovely comments. It does make us feel wonderful. 2. You didn’t get lucky and think “yeah, it always happens to me, I aint that lucky” and start to grumble about how unlucky you are. Let me tell you something… irrespective of your state of mind, I definitely want you to please care about this recipe. This is absolutely worth it! I waited almost 6 years for this recipe! Yep… 6 loooong years! This recipe is from a professional baker. I’ve been having this cake almost every other week for the past 6 years but the recipe remained a mystery to me. I speculated about the ingredients and techniques for long and wondered, how can anybody bake something so so moist and yummy. I got a shock of my life when I got the recipe finally! Yeah yeah… ok here’s the recipe, but I wanna share something else with you before that (please bear with me a minute). So we celebrated the fifth b’day in a grand way, I suppose. Yep, it was pretty grand for us, considering the fact that we are not the type who make every event into an occasion, this was pretty grand. Ok what I was trying to say is that, MariasMenu got her b’day wishes, you got your return gift, but what about the b’day present for the b’day baby? Ohh yes! She also got a gift, yep a new lens! You’ve already seen the work of the lens in the Chicken Tomato Roast. I dont know whether you noticed any difference there, did you? You know what… I’ve this habit of trying to relate each n every situation in my life to some proverbs/wise saying/ old saying. Here’s how I feel about the new lens in my hands… “pattikku muzhuvan thenga kittiyathu pole” or “Korangante kaayil poomala kittiya pole” ;) ( I guess translation will not give you the exact idea, so my non Malayalee friends, please excuse me :) ) what to say, it’s a tie! Please check out these cupcakes at Swapna’s place. Thanks a lot dear! Nisha also tried these cake, please check out her version here. Thank you Nish! There is another version here, thank you so much Priya! I don’t think I can ever truly tell you how much I LOVE ur blog :D Thanks a zillion times!!! P.S… the b’day gift sure seems to be doing wonders :) That’s a soooper foto!!! Thanks a bunch! I guess it was holiday time for you, how come you are at office? Congrats on your 6 month anniversary! I used to make something special every month till our first anniversary, now it feels like a long time ago, hhmmm…. I do hope you’ll like the cake. k… looks like you have busy days coming your way :) Anyways, enjoy n have fun baking n cooking! Like you really need someone else telling you how awesome this cake is? Never the less I think it is the nicest chocolate cake I’ve ever had, and is the only one I will make in the future. Chocolate cake is generally a disappointment, the texture seems too bread like, often not dark enough or chocolatey enough. This is how I have always thought chocolate cake should be, but never was. I don’t know why I didn’t make it when I first found your recipe. Damn my patience! I read someone used brown sugar, I might try that next time to see if it gives a hot fudge quality. Thank you so much for taking time to share your feedback here. I’m glad that it worked out perfectly for you..
Hope you like the brown sugar version too..
Hi Maria, I tried this receipe today thinking ill get a wet texture but mine turned out pretty dry. Any thoughts ? Baked at 180 deg fan for 24mins by then it started cracking at the top so I took it out. Also I found the batter very watery – is that how it is supposed to be? I wasn’t sure about the watery consistency hence added some extra flour to thicken the batter to prevent it from leaking through the mould. Hi Anusha – Yes, the cake batter is very liquidy. I guess adding extra flour will affect the texture of the cake. Also, the temperature is given for without fan, so I guess that can also be a reason. I do hope you get to try it again and it comes out well. Dont worry about the batter being too watery, it comes out ok.
hmm interesting…i suppose the heating together milk, butter, oil & coco powder makes a difference? Hi Maria, I am a regular visitor to ur blog n itz truly amazing….wonderful job..keep it up!! I just tried the moist choco muffins n came out well n in 5 minutes the whole lot vanished…it was too yummy & thanks again for the sincere efforts n mouth watering recipes…how far has ur book reached? I am always game for a new Chocolate cake recipe and one which looks so sinful,I am sure would taste spectacular.Bookmarked to try immediately!! Congrats to all the giveaway winners!! Thanks Divs! I do hope you will like this one! OHHH MY God!! !, I actually won it?? I cant believe it, OHHH I am sooo very excited! no words to express my happiness!!! Thankyou sooooo much!!!….. And because of my excitement I completely forgot to mention about those gorgeous cupcakes,,,,,they loook soo yummy….and nice clicks!!! and thankyou for sharing such a easy and yummy recipe….was really hunting for a recipe like this…you read my mind!!! Ur cake looks so delicious… im definitely going to try this some time..
Maria, That cake looks delicious..! And such a rich dark color, very tempting. Congrats to the winners and am sure the lens will add to the magic of the site.. so clap clap for the b’day gift :)) and here is to more delightful pics on ur site. I am already half way to my kitchen as I am writing this….So many things running thro my head. The name mentioned in the gift coupon, is that my name??? Still perplexed..If it is, then my acceptance speech is running thro my head…ha ha ha…..Looks like I am only “running”…..I have never won anything like this before…So thank you dear….The new lens is really working……ohhhhh…so much to write…wish I could speak to you sometime…..
Its your name sweetie :) Looks like the giveaway helped you in burning some calories with all the running ;) I’ve sent you a mail, please reply to that so I can send you the coupon, okies? Thanks a lot Shabs dear :) I was so thrilled to hear that you tried it on the same day itself! Yeah for you, I think we need to put a double dose of ganache ;) The batter is actually flowy n not thick. Thanks Priya :) I hope you can try it soon. Happy baking! I just love ur blog beyond words!! I can see that you have not added any flavour here.Is it not necessary coz egg is being used?Also could you please tell me how you decorated your cup cake as shown in the pic? BTW,great clicks..congrats for a wonderful birthday gift…. looks so delicious..love the dark colour..will try this one soon..
Hope you get to try this one, happy baking! This recipe is something which I looked forward to in my life..But I’ll have to wait till I set up my new kitchen…Can you suggest how to bake this cake in a microwave Oven? Thanks :) hhmm does your MW have convection mode? In that case, you can bake in that. After switching on the convection mode, follow the same procedure. 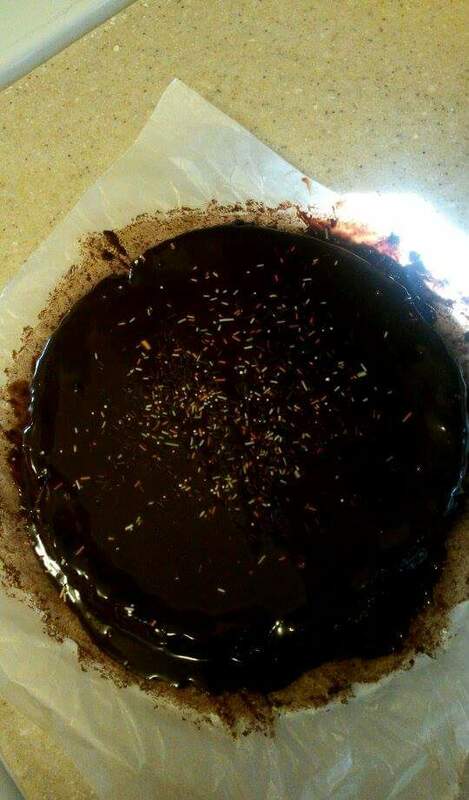 i tried ur cake recipie today .my cake become fudge.it didnt come out how i wanted.could u be able to figure out where imight have gone wrong as i am very new in baking.million thanks for ur blog which is a real help to people like me. Thank you so much for trying this recipe. 1. Always preheat the oven at the specified temp for a minimum of 10 mins before baking. 2. Keep the cake tin in the middle rack of the oven. 3. I normally switch on the top n bottom heating mode of the oven. 4. Do not open the oven for the first 10-15 mins of baking the cake. 5. If you feel that the top part is cooking fast n the center is not cooked yet, place a sheet of al.foil over the cake tin. It will prevent over browning of the top portion. I hope this helps… did any of the above steps go wrong with your baking? The cupcakes are gorgeous… lucky are those who receive these in Bahrain! Maria this cake is so heavenly. Tried it out, by far the softest n most moist cake iv had…also they slice so beautifully!!! Thanx a ton for the recipe!!!! you are welcome dear :) Its a pleasure to know that it came out well for you :) Thank you so much for the comment! Thanks for the give away.. I do hope you got my email reply. Anyways, as I’ve mentioned in the notes section of the recipe, the original recipe calls for baking powder. So you can use that instead. For this particular cake use the same qty of baking soda ok. I do hope you get to try this soon n you will like it too. Please do share your feedback. Am a regular visitor of your site.All your recipes are awesome.i had tried couple of recipes,all came out well.Thanks for sharing your sweet recipes to all of us.This cupcakes looks yummy!!! !i will try it soon.I have to know that this can able to bake in microwave,if so please let me know. Thanks a lot for the lovely comment! Its great to know that you rty recipes from here regularly. If your MW have convection mode, then you can bake these. After switching on the convection mode, follow the same steps. Thank you for the amazon coupon..
Congrats again! Will send you the coupon soon. is there any subsitute for egg if i want to try this recipie ? I havent tried it with egg substitute. But may be you use yogurt as a substitute. May be try with a small qty n see if it works. For the above qty, try using 1/3 cup of beaten yogurt. Hope it works. Please do share your feedback, if you try it. wow! Its a good thing that it came out well without any eggs or egg substitutes, may be I should also try it that way…. I havent baked in MW yet dear, so I’m not sure about the temp setting and stuff. But I guess, you can use the same temp as oven in MW convection too. This looks so yummy, I am already salivating !!!!!! I will try this one for sure once I get my oven home…. I tried this cake on the weekend and it came out great even using a microwave. Thanks for posting this. You are welcome! Its so nice to know that you liked the cake. Thank you so much for the comment. Omg! !..Maria..they are so sinfully inviting..i am soo gonna try them….This is my first time on your blog..and…i LUV your space! !..Keep up the good work!! Thank you so much Asma! Hope you get to try them soon & like it too. Please try other recipes also when time permits. hey..just tried this cake…as I too am a sucker for plain cakes. It was absol amazing! everyone loved it. just one query though..my cake sunk in the middle..i used regular flour + baking pwder. do i also add the baking soda? maybe I shud have left out the soda…what do u think? Thanks dear! Nice to know that you liked it. The cake usually sunks in the middle if there is a temp difference or something like that. Did you open the oven in between baking? It can cause a temp difference & as a result cake can sunk. :) Please try it dear and I do hope you will like it. Btw, how’s your baking experiments going? I tried this cake 2 days back and it was just fabulous!! So easy to make and super-yummy too. Am planning to make it again soon. Thanks a lot for sharing this great recipe, Maria.. Since we are vegetarians (no eggs either) would you kindly suggest me an alternative I can use? Also, can that be applied to most of the recipes? Any other ingredient that I need to replace while I bake without eggs? Thank you so much for dropping in. Hi maria… That picture is soo YUMMY!! Actually i would like to try this recipie.But still am n doubt wht s baking soda? ?Baking soda and cooking soda are same?? Hi Maria,I am new to your site but really liked the recipes that you have put up.I have already tried your ultra moist chocolate cake and it was yummmm:)Thanks a lot for sharing.Keep posting. Please try out other recipes too when time permits. Thanks for the comment too.. I came across your site while looking for an easy recipe for a moist chocolate cake. Mine is always dry and crumbles. thanks. The recipe seems easy but the thanks is for the notes which make the recipe easier and provide the substitution for self raising flour. Will bake this cake this weekend and post my experience here. Thankyou. What a fabulous cake… Looks amazing… Gonna try it out this weekend :) Is it ok to bake this in a standard 9″ cake tin?? Thank you! Yep, you can use a 9″ cake tin, just adjust the baking time accordingly. Hope you will like the cake. Hi Maria, Just wanted to say a big thankyou for sharing this recipe. I made it yesterday for a family birthday and must say it is honestly the best chocolate cake i have ever made and tasted by far!!! I made it using Nestle’ cocoa powder as Hersheys’ is hard to find in Australia and expensive too yet it still turned out amazing! I can’t wait to try some more of your recipes now. Nice to know that the chocolate cake was a hit at your place :) Thank you so much for the comment! Hope you get to try some other recipes also… Happy cooking! Hi Maria. Im a new reader of your blog. a total newbie to cooking. I tried this cake recipe as i had bought a new microwave oven and people couldnt believe that i had made it. It turned out awesome. Thanks Maria. Now i cant wait to try out pineapple upside down cake :) Thanks so much. You are welcome dear! Its a pleasure to know that the cake came out well for you :) Thank you so much for the comment! I am planning to bake this cake tomorrow as I am hosting a party. Awaiting your early updates. Thanks for trying this recipe. About the cake sticking to the pan, make sure the cake cools and then try to transfer it from the baking pan. Its best to use parchment paper, but if its not available generously greasing the tin is the next best thing to do. Hope your cake turns out great for the party. Thanks for your response Maria. The cake still stuck to the pan even after generously applying butter. But I still got a round cake out of the pan, though it left a single layer stuck to the pan. But covered the flaws with generous application of chocolate frosting. It was perfect and everybody just loved it and asked for extra servings ;) Thanks a ton again. Now going on a search for parchment paper… Where are you based on? butter the pan nicely and spread all purpose flour and tap it ,dont touch. hope this will help u..
hey, i tried this and it was a big success. three people finished the entire cake in like two hours! thanks a lot. Great to know that the cake was a hit at your place :) Thanks for the comment! Bleated anniversary wishes to you! Hope you had a great day. Yesterday was my daughter’s b’day . We always buy a cake from outside every year. Since I have tried a few recipes from your site successfully , I thought of baking this cake , and it came out very well. She likes all stuff made with chocolate and she loved this one. Thanks you very much. I have a small doubt though, is whipping cream same as wonder whip, I tried ganache with wonder whip from foster Clark but it doesn’t set after applying to cake, it was still moist. I would like to know what went wrong,so I will be prepared for next time. hey… thanks fr posting this recipe…i baked it for a friend at the eleventh hour.. and turned out one of the best moist cakes EVERRRR… i am keeping it as my all time fav recipe now.although it took longer fr me to bake in the convection microwave..thanks yt again!! Hey guys, I just made this cake for my fiancee, it’s his birthday today. I spent quite some time online looking up for a very moist chocolate cake and it was 1000% worth it! Wonderful cake, very moist and delish! My fiancee and friends who came over looooved it! I had a chocolate frosting on top and it was a perfect combination. Thank you so much! My cousin made this cake yesterday for a family BBQ and it was to die for. I just had to know her secret so herei am in the process of making it myself. Very moist. Very delicious. Topped with a almost syrupy chocolate ganache and vanilla ice cream. Thank you for making something so delicious available to us baking rookies with a method so easy to follow. may i know the milk you mentioned is what kind of milk ?? can i mix milk powder + water to get that ? I think you got the answer already right from FB page :)? Anyways, I’ve used fresh milk for this recipe and I havent tried it with milk powder. Hi I am based in the uk, so took me quite a while to adjust the recipe from cups into grams and mls. I have used a very large loaf tin, so the cake took forever to cook, but it is worth it!! Delicious!!! Thankyou. Nice to know that the cake came out well even if you had a bit of trouble :) Thanks a lot for trying this recipe and also for the comment. Thank you! I do hope your cake came out well. Dont worry about the runny batter. It’s supposed to be like that. Majority of the readers prefer cup measurement, hence I give it that way. Unless, its specifically mentioned in the recipe, I think it’s better to use sunflower oil for baking. The cake is actually very soft and light in texture. Hi Maria! This recipe is seriously amazing and so easy! I wish I took a better picture. I topped it with ganache made with low fat milk, and I added a tsp of vanilla essence to the recipe. Everyone thought it was fabulous. Thanks again for this! I baked it in a round tin and it took around 45 mins to bake perfectly. Given the size of the tin I think I could have doubled the recipe to make it higher. It was only about 1.5 inches high after baking. Thanks and keep up the great work! ‘I tried this cake today .Must tell you the process is very easyyyy and tastes superb.!!! But only the baking time drove me crazy .I think my new oven(not microwave) with convection is the culprit….could you pls suggest how long shld i bake @ 180 . As chocolate cakes are all time fav in my house .And this recipe will top my list.Thank you for sharing….Great!!!!!!! keep going……. I think the baking time varies for each oven. I’ve given the time took for me in the recipe. Was this the first thing you baked in your new oven? Thanks for this yummy recipe! My wife really loved it! You are welcome Alison! It’s so nice to know that your family liked it :) Thanks a lot for the comment! Thanks dear! Yeah, everybody gets a bit scared when they see the runny batter, but it’s like that only :) I’m so happy that you liked it. I have tried a number of your recipes but I keep coming back to this cake!!! Its yummy and a favorite with my family…I haven’t yet managed to shoot a pic of this cake but will try to do so the next time I bake and mail it to you…thanks for this yummmmm recipe….. Thank you! Nice to know that this cake is a favourite of your family :) would love to see your cake pic. Hope you get to take a pic next time. I have never EVER baked a cake before from scratch – I am a total rookie when it comes to baking desserts; for some reason, I felt like making this…and not just for myself, but for guests!!! It’s such a non-fuss recipe! It turned out awesome! I didnt have enough chocolate for the ganache but I used the 80g of dark chocolate i had to make into a chocolate syrup….I melted the chocolate with 1 small can of sweetened condensed milk with a table spoon or two of milk. It soaked into the already moist cake and the result was YUM!!! Leftovers stayed YUMMY for days! Thank you for this recipe!!! I tried this cake today and it turned out like a brownie, didnt rise much.. was more flat but it tasted good. either the oven temp was high or the cake was baked for a long time? Also, if the raising agent (baking powder/baking soda) is not fresh (i mean if it’s nearing expiry) then it may affect the cake at times. I havent tried this cake with wheat flour yet, but I think it willl make this cake dense. The texture of this cake is so soft and light and I doubt you will get the same texture if you use atta. Thank you! yep, it’s an easy one. Great to know that your family enjoyed it. I am a first timer in your blog. I would like to ask how is it possible to prolong the shelf life of your cake? What do I add? Thanks so much! I usually dont store cakes for more than a cake except for the Christmas fruit cake. If you want to store it for 1-2 weeks, you can store it in fridge and if for longer time, you can freeze it. Maria… it came out excellant.. but it was too moist tht i could not cut it…podinju pokuaarunnu… is it becos it required some more baking time? I took it out after 25 minutes of baking and when the tooth pick inserted came out clean.. it was greatly cracked on top also. I baked the tray in the middle with heat option set to both sides! Pelase help. does any of this apply to you? I do hope it comes out perfect next time. The only white coloured icing I’ve used is whipping cream icing, cream cheese icing and butter icing. Out of these, my fav is cream cheese. Thanks MAria.. I will try out and let you know.. also want to experiment on Red velvet cake witha natural color. Will let you know the outcome. Though I havent tried making it with coffee, I think you can do that. The qty depends on how much coffee flavour you want in your cake. If you are looking for a strong coffee flavour, you can use 1 tbsp instant coffee powder in 1/2 cup hot water and add this to the cake batter. Also, please check the sugar qty also if you are using strong coffee solution as well. It’s not a very sweet cake. First of all a very happy b’day to your daughter! Thanks a bunch for selecting this recipe to bake on a special occasion :). I’ve never tried baking with coconut oil, sounds like a good idea! I made this cake and it came out swell. it’s the darkest cake i’ve ever baked, thanks Maria! Sorry to hear that the cake didnt turn out well. I’m not sure why it happened like that. I use Hershey’s cocoa powder. Did you check the expiry date of he cocoa powder you used? Hi Maria, i tried my 1st chocolate cake with the help of your recipe,but it didnt turn out good,it was very bitter, i guess the cocoa powder was too much in it. Apart from that it had a very bland after taste,as that of the flour itself…..is there a specific order in which we add the dry ingredients,to the chocolate & butter mixture.I added sugar,flour and then baking soda….. It was however very moist. From your comment, I assume either the cake batter wasnt mixed well or the cake was undercooked. I dont know how the bitter taste can come, may be you can try with another brand coco powder. There is no particular order in adding, since everything is mixed together. Hope your cake comes out well next time.. Happy baking and all the best! You are welcome Mohini! Great to know that the cake turned out well :) Thanks a lot for sharing your feedback here. Hi Maria..am baking a cake for the first time and that too in my convection microwave, searched for lots of easy recipes, and somehow came upon this one of yours, always loved dark soft cakes..specially my husband loves cakes…so wanted to to try out.. really many many thanks, it came out so well…was very yummy..will surely recommend this recipe..also very encouraging that my first trial was a success..Thanks a ton! Thanks a bunch for your encouraging words dear.. yeah the baking time varies for each oven.. I’m really happy that the cake came out well for you. Hope your little ones are doing good.. Thanks a lot for your comment dear! I’m also happy that you tumbled onto my site :) Great to know that you liked the cake recipes. Great to know that you could successfully bake with the recipe posted here. Also a big than you for recommending my site to your friends and family. Best chocolate cake ever. Liked how it wasn’t overly sweet and very moist. I was going to make the ganache frosting and needed a cake to go with it. I was pleasantly surprised when I saw this cake had that frosting. Made it with a friend who had never made a cake from scratch. She couldn’t believe how easy it was and how much better tasting than a box. Will definitely make this cake again and again. Thank you so much for sharing your feedback here. The cupcakes tasted HORRIBLE. I couldn’t just get what it tasted like. They all got wasted. Would never try the recipe again. Sorry to hear it didnt work out for you… it’s your wish whether you want to try it again or not.. Omg!! I just made this cake and it was perfect!!!! Thanks so much!!!! So yummy so tasty so perfect!!! If I want to make a larger cake or more cupcakes do I double the quantities of the ingredients? Thanks a bunch dear :) Yep to make larger qty, double the ingredients and adjust the baking tins and baking time accordingly. Maria, the cake came out so well. thanks a ton for the recipe. It was super moist, dark in color and yummy.. I posted a comment yesterday. Since this recipe has got a record number of comments, I am not sure whether it really reached you. Not able to find mine. Want to thank you and say that this is such a great recipe. The cake came out looking lovely and dark, super moist and yummy. Thanks a ton !! With your help, I am now officially a baker ..yay !! I loved the texture of the cake, the way it is not overly sweet, just everything about it. Thank you again, God bless. Your comment did reach me :) Sorry, it took some time to appear on the site. I’m really happy that you liked this cake. So baker, what are you going to bake next :)? Thanks a lot dear for sharing your comment here, appreciate it very much. I want to try this out tomorrow, but you said you wouldn’t suggest to layer it. What if you bake two separate batches then put one on top of the other would that work? First of all my apologies for the delayed reply :( Yes, you can bake 2 different cakes and layer it. I do hope you got to tried this one and liked it too.. I made this tonight and oh my goodness! amaze!!! such a gorgeous cake, moist and delicious! thanks for posting the recipe! mmmmm nom nom nom! Thanks a bunch Carly :) Loved your comment! hmmmm im really hoping to make this kind of super moist cake for years .. I have seen this on your blog and checked the other versions using the same recipe but yours looked the best among the rest . How did u make it so wet looking that it shines when its photographed (super/very moist) lol while the others looked a bit dry compared to yours? well im basing it on the pics they posted. I really really love how this cake looked like. It looks so delicious and the melt in your mouth type of cake which I really love to make. Thank you very much Jenny! I didnt do anything different from the recipe, I just followed the recipe to the T and I’ve shared my extra tips in the notes section :) I take the food pics in Natural light to do maximum justice to the recipe, may be that’s the reason. I do hope you get to bake it soon and it works well for you too.. Happy baking and all the best!! Wish you a Merry Christmas and a Blessed New Year! I found this cake to be very oily/ greasy, rather than moist. I think I would choose another recipe, as I find that all I could taste was the oil… I used a bland rice bran oil, and it still overpowered the chocolate taste. I felt like I had taken a spoonful of oil, instead of cake. It also did not make that much cake… it just made a 7 inch round cake at a reasonable height. I made this cake again…. I put in 125 g butter, and 1 tablespoon oil, instead of what the recipe says, and put in a half tsp of baking powder, instead of soda, wow, it came out delicious, soft, super moist and chocolatey, and looks just like your pictures, instead of the weird oil-soaked kitchen sponge I made yesterday. I think perhaps, the difference in flour that grows in different places can account for it. This flour I have needed more rising and less oil. So great, now, wow. Thanks for the recipe, but don’t be afraid to change if needed! I am at sea level, so altitude couldn’t have had anything to do with it. So glad it turned out, now, thanks! I’m happy that it worked for you finally. I’m not sure why it didnt come out well in the first attempt. I always give measurements in the site, based on my trial and errors. Unfortunately, sometimes it doesnt work for some people :( But, I’m really happy that with a few adjustments, your cake turned out well. Thanks for giving this recipe a second chance and for sharing your experience with me. Thanks Maria, I hope you have a Merry Christmas, too. Yes, it was really strange how the adjustment worked. I know I measured right the first time, because my husband double checked me, as we always do with new recipes…I took this cake to work, covered in modelling chocolate in a Christmas flowers and leaves theme. There was none left within an hour (only 7 people! ), and everyone praised that it wasn’t too sweet. I’m going to attempt to convert this recipe to an Ultra- Moist ginger cake, made with buckwheat flour…I’ll tell you how it turns out. Thanks for the wishes. Glad that your friends also enjoyed this cake. Thank you so much for sharing the pic with me :) The cake looks really fab! wish you a wonderful and happy new year! THank you !! and same goes to you and your family ! Cheers ! Hi. Maria, I really loved this recipe, very rich and an icing in itself. I added 1/4cup of walnuts and 1/4 cup of orange peels just for a little pizzaz for my husband and he liked it. I have recommended this recipe to my friends as well. The ultra moist chocolate cake was wonderful..haven’t had a chocolate cake that was good even without icing.. I think the moistness serves as an icing/ filling in itSelf. I spiced it a little bit for my husband by adding 1/4c of walnuts and 1/4c orange peel. It just added a little more crunch and added a variety to the flavor. Thanks Maria and looking forward to trying more of your recipes. By the way I tried your mocha walnut bundt cake , it was good too, reminded me of the Ann’s marble cake. Can I post this in my blog referring back to your link? HAD to write a bit on this recipe. I’ve made it thrice and its become a firm favourite around here. Came out really well the first time around- so much so that it was polished off within a few hours with lots of complaints from my hubby and son that I had made too little! ( I had used the same quantity as in the recipe and had been planning to use it as the ‘informal’ b’day cake for my daughter – can never be sure when my kitchen jinxes begin to kick in). It was a pleasure to read your experience with this recipe :) I’m really happy that this cake is liked by your family n friends. Belated b’day wishes to your daughter. Hope she had a wonderful b’day! Awesome cake recipe.. I tried it the first time and it was a super hit.. I use my microwave oven and the first time around the cake needed 35 mins in the oven..The second time, I tried doubling the quantities and increased the baking time to 45 mins… The cake is tasty but slightly under-baked and I’m a bit disappointed.. Any ideas? Good to know that the cake turned well. Try baking it a bit more longer when you bake double the qty or you can use a bigger tin and bake for 45 mins. OH MY GOODNESS! What a recipe! This was absolutely delicious. So moist! I was very skeptical about trying this out; for one one I don’t have a lot of baking experience and two, never had to heat ingredients to make a cake so I was unsure about it. But all the positive reviews here gave me the hope that maybe I could find success in this recipe. And I am so glad I made it. Turned out extremely well and this is recipe is a keeper. The only thing that didn’t seem right was that the cake deflated once I took it out of the oven. I was watching it when it was baking and saw that it had risen a lot and had formed a peak about an inch higher than the baking tin. But once it was out it deflated and became flat, still risen though (to maybe about 1 1/2 times the level of batter). Did this happen with your cake as well? Thanks a lot for the recipe. Here’s a picture of my cake. Your cake looks fab! I’ve shared it on MariasMenu FB page too.. The reason for cake forming a dome while baking… it usually happens, when the cake tin used is smaller. Next time try using a bigger pan. I think it should work. This is a recipe for keeps! I made this cake(without the ganache) for valentines day… and it was super yummy. Thanks a million for this wonderful recipe… without doubt, this is the best chocolate cake ever! Thank you so much Ida :) Really happy that you liked this cake. This is the best chocolate cake ever… thanks a million for super yummy recipe! The cake looks delish!!! :)Am dying to try it out!! Just wanted to know whether the cup measurement is based on the USA cup measurement system or the Australian/European and also whether the flour and cocoa powder were sifted and compressed before measuring? Also what was the brand of the flour that you used and for how long was the egg beaten and what should the size of my baking pan be if I bake a round cake?I apologize for the number of questions but i just want the cake to turn out to be perfect!!! I use the standard baking cups that’s available here in Bahrain. I’m not sure whether it’s American or European measurement. I think, you can use the cups that you’ve, provided everything is measured using those same cup. As long as the proportion of the ingredients are correct, it should be ok. I havent sifted the cocoa powder and flour. I used Bahrain mills all purpose flour. Just beat the egg using a fork, like how you do to make an omelette. If you are baking the above qty, you can use a 7 inch round cake tin. I tried out this recipe. It was excellent though it was not ultra moist. I probably missed getting the quantity/ quality of ingredients right. Nonetheless, i personally loved the recipe compared to many others that i tried. Since it was soft but not so moist, i was able to layer it as well. Just wanted to know how i can get the stiff whipped cream frosting. Everytime, i seem to struggle with it. To get a stiff whipping cream, keep the whipping cream in freezer for 5-20 mins, just before whipping it. Also keep the beater and vessel you sue for whipping, in the fridge for half an hour or so. You can also add a pinch of cream of tartar, it gives stiff peak. You can also check out whipped cream icing using gelatine, it gives a very stabilized icing. How long does it take to cook? I’ve mentioned the baking time in the recipe itself. Please refer to the same. I baked the cake recently for my husband’s birthday and it was a big hit! Thank you for sharing it! Thank you Nani :) Belated b’day wishes to your husband! This is a delicious moist, yummy chocolate cake! I only used half a cup of sugar and a bit more cocoa for a more deep chocolately flavour, served with ice-cream, just lovely! Thanks for the recipe! By accident I forgot to put egg in the cake but still it’s delicious. with the Ganache I use think cream and still it’s yummy. Thank you for sharing this recipe Maria! Thank you Cherel :) Btw, it’s nice to know that it worked well even without egg! This recipe is the best! Thanks for sharing Maria! I accidentally forgot to put the egg but it still come out perfect and delicious. I used thick cream with my ganache and it work perfectly. Will this amount of batter be enough for a 13″x9″ cake pan? I think it would be better if you make 1.5 times of the qty given in the recipe for the pan size you’ve mentioned. For how much tym should i bake it in micro convection mode?? Hi Sagrika, I think the baking time will be the same as electric oven. The timing can vary depending on the size of the pan you are using. Hi what size tin do you use to bake the cake? For the qty mentioned in the recipe you can use a 8 or 9 inch round cake pan. Love it! My search is over! been looking for a moist chocolate cake recipe for a long time and I’ve tried a couple but none of it satisfied me since I tried your recipe. OMG…this is the recipe I’ve been looking for. Very moist and taste sooo goood. My children loved it. Thank you for sharing your recipe. I have one question, you said that you dont use this in fondant because it is very moist, what if i will use this cake in marshmallow fondant how bad it is gonna be? I really love the cake but I want fondant so i can make my daughter’s cake really colourful. What should I do.Or do u have other chocolate cake recipe for fondant? My daughter’s birthday is next week, so i really need a chocolate cake recipe with fondant. I hope u can help me. Thank u! Thanks a bunch Christina for your lovely comment! I’m so happy that this recipe ticked all your boxes :) Also I’m glad that your kids liked it. Well I havent tried working on fondant, so I’m not sure. But I think if you are not cutting the cake into layers, it should be ok. If you are planning to make a layered cake, it would be better if you make two separate cakes n layer it. Also, check out this chocolate cake recipe. This is also very moist but a bit firmer than this one. Also one of my friends have tried fondant icing with this recipe and it worked well. Wish your daughter a wonderful b’day and May God Bless her! Thanks a lot Maria for your reply. You are so generous in sharing your ideas. I have one more question if you dont mind, my daughter’s bday is on Sunday but I have work Sat & Sun, the party will be in the evening so I still have time to pepare after my work but I only have a few hours to set up everything. Can I make the cake on Friday? Where can I store it after? Thanks again. Yes, you can make this cake ahead. Once the cake is cooled completely, wrap it in cling film tightly and leave it on your kitchen counter. Make sure you dont leave it in a humid place. I’m talking about the uniced cake here. Hope the birthday girl enjoys her cake.. I got many many compliments for the cake. You are welcome dear :) Great to know that you chose a cake from here to celebrate your MIL’s b’day, thank you! Thanks again for sharing your feedback with us. Hey! I have tried this recipe twice before and it came out perfect! Baked it for my entire class(of 70) and each one enjoyed it! Will ensure I use this recipe for the rest of my life! Thank u! Thanks a lot for the wonderful feedback :) I’m so happy to know that you find this recipe to be a keeper! One of my friends loved it so much that she wanted to know if we can make the same without eggs as well. Any comments / suggestions? I havent tried this cake without eggs. But I think one of my reader’s tried it that way. Can you please check the comment section of this recipe to know the details? Yes, just saw that. Ok then will try it out without eggs this weekend. :) Thanks again! I made this today.texture is good.but I find it too bitter..I used the exact measurement and baked in a baking tray and cut it small brownie sized pieces..yield around 50-60 pieces.i didn’t do frosting.i am just wondering how I am gonna finish this.i am not telling that it is too bad but it is too bitter for me. (even for a chocoholic like me).any easy icing /icing idea for this cake ? You can use chocolate ganache icing or plain chocolate icing for this cake. Please have a look at the cake recipes on the blog to see the icing recipes. I made this today.Texture is good.but I find the cake too bitter .i have baked it in a baking tray and cut it into brownie size pieces yield around 60 pieces.i am just wondering how am I gonna finish this.not that it is bad I find it’s too bitter.i didn’t make the frosting .could you please share any topping ideas.? I am running out of cooking chocolate,butter and cream right now. Thank you so much Lesley :) I’m glad it worked out well for you. Hope your nephew enjoys his b’day cake. Can I replace the oil with melted butter? sorry dear for the delayed reply :( did you bake the cake? I havent tried this with just melted butter, I think the texture may be different if you are using just butter. Do you have any tips on how I could make it a little more firm? A bit of it broke off even after cooling completely and I had to “reassemble” it before doing the icing. is it okay to bake wit the basic microwave? Hey Maria…This cake is so Divine I must say..it just melts in the mouth…How do u manage to come up with such awesome recipes…Hats off to you…I made this cake for Christmas…I did not have cup cake molds..so I baked it as a cake ..I wanted to make something special..so I made two cakes and made a chocolate sauce ( don’t know if I can call it a sauce..I melted some cooking chocolate and added some cooking cream and butter to it)..I poured this sauce in between the two cake and refrigerated for some time and once I took it out I poured the rest of sauce on top of the cake…And it was just heaven!!!!! As mentioned in the recipe, I got a 9 inch loaf and 10 std size cupcakes from the above qty. I didnt double the recipe.. I guess it should fit two 7 inch, if the pans arent too deep. Hope you get to try this soon and like it too..
First of all my apologies for the delayed reply. There was some tech error when we upgraded the site recently and so some of the recipes were not showing on the site. However we’ve fixed it now. 1. Preheat the oven @ 180 C/350-375 F, 10 mins before baking. 3. Heat together milk, butter, oil & cocoa powder till the butter melts. Let it cool to room temperature (btw, don’t get disappointed if it doesn’t look very dark at this stage: it darkens up during baking.). 4. Add flour, baking soda, sugar & beaten egg to the cooled wet ingredients. Beat it well using an electric beater or hand whisk till it is mixed well. 5. You can either use it to make cupcakes or cake. 6. Bake in the preheated oven for 15- 20 mins for the cupcake & 25- 30 mins for the cake. The baking time can vary slightly depending on your oven. 7. For cupcakes: Line your cupcake tin with paper liners (I use 2 liners per cupcake) & pour 3 tbsp of batter in each case. I’m referring to the standard size muffins here. 8. For cake: Grease your cake tin well & line with parchment/baking paper. Pour the batter. 11. Place the baking chocolate (or chocolate chips or buttons) in a bowl. 12. Heat the cream on low flame till small bubbles start appearing around the edges. 13. Pour the heated cream into the bowl with chocolate. 14. Let it rest for 5 mins. Whisk it using a manual whisk. This will give you a liquid consistency ganache. If you want to thicken the ganache for spreading, place the bowl on some ice & whip it. It will start thickening. 15. Spread the ganache on cooled cupcakes or cake. Enjoy! This is an extremely moist cake, so it’s not suitable for making a layer cake. You can store the cake (without ganache/icing) @ room temp for 3-4 days in an air tight container. Substitution for self raising flour – to 1 cup self-raising flour, add 1½ tsp baking powder+ ¼ tsp salt to 1 cup all purpose flour. I can’t see the recipe.. . Do anyone else had the same problem? We had some tech issues earlier that’s why you couldnt see the recipe. However we’ve fixed it now. Hey brilliant recipe. Tried it and my 2 year old nephew went crazy over it. Thanks for the recipe. For the qty mentioned in the recipe, I think you can use a 7 or 8 inch round cake tin. Yes, you can double the qty if you like. Hope you get to try it soon and like it too..
Hi Maria, thanks for your reply. What an absolutely beautiful cake, just melts in your mouth, it’s a keeper for me. Thank you so much :) Good to know that you consider this a keeper recipe. However I’m not sure what went wrong when you doubled the qty. Did you use 8 inch round pan for double the qty also? If so try using a bigger cake tin, though I’m not sure whether it helps..
Hi Maria, thanks for your reply. I tried to cake again with a 10 inch round cake tin and worked perfectly. Thank you. Will be making it for my son’s 5th birhday party. Great to know that it came out well :) My b’day wishes to your son! Hope b’day boy enjoys his cake. You can heat it directly in a pan, no need of double boiler. Thnks alot. I tired the recipe. It was super super Moist n delicious. Enjoyed it alot. It was over within half an hour ;). Thnks for the recipe. You are welcome Bernice :) great to know that this cake came out well for you. Thanks a lot for leaving a comment here. Hi, thank you for this recipe. I’m very eager to try it out. But I don’t have sunflower oil and my grocery doesn’t carry it. Can I use canola oil instead? You are welcome :), Yes you can use canola oil. Hope you get to try this soon and like it too. Probably the best choc cake my kids have ever demolished! Thank you!! A definite keeper. wow!! that was a really great feedback Irene :) I’m really glad that you liked it. the cake turned out really delicate and i breaks very easily. it is very difficult to pack it and take out on picnics. what do i do to increase the strength so that it does not become mushy when packed? can we use fresh homemade white butter for this cake? Though I havent tried using it, but if you’ve used that butter for baking before, I think it should work for this recipe too.. I tried it! I also used 1/2 cup of flour (because it was very watery) and some red food colouring to make pink cupcakes! It turned out delicious. I still think that chocolate is better. I have a niece who wanted vanilla that day and it worked. I’m sorry to hear that it didnt come out perfect :( Pls check out the below link, hope it helps.. I found this recipe while looking for a moist chocolate cake recipe… I’ve usually used the pudding in the box mix but I’d really rather have control over the ingredients so here I am! My question is, can you make this in a bundt pan? My fav is to make a chocolate bundt cake & thin out chocolate icing & pour over it… It’s the perfect amount of sweet & I’d love to use this recipe for it! Thanks for dropping by. I’ve never tried baking it in a bundt pan, but I guess you can. But make sure you grease it nicely. Please keep in mind, This cake is very delicate in texture. Hope you get to try this soon, All the best and happy baking! I’m happy to know that this recipe worked out well for you.. Thanks Cristina :) I do hope you like this cake. All the best and happy baking! i just made this cake after reading all the amazing reviews. i added a little vanilla essence and the taste and moisture was fabulous. 2) the cake is very greasy and oily- do you think i can reduce the quantity of oil? or increase the flour? if so by what quantity? Thanks for trying this recipe. Hope it comes out perfect next time. You are welcome :) Nice to know that your first baking attempt became successful!! Thank you so much for sharing your feedback here :) I’m surprised that you were able to layer this cake and am happy that it worked out well. This cake covered in slated caramel sounds yum! The cake looks amazing… Planning to try this one out… One small doubt… The egg we put, should it be lighty beaten by hand or should it be made soft and fluffy using an electric blender. You can just whisk the egg lightly using a fork, before adding to the batter and then once it’s added, mix it using a electric beater. I am fairly new to baking… Planning to try this recipe out…. One small doubt… Should the egg we use be lighty beaten using a fork or should it be made soft and fluffy using an egg beater…? Since confectioner’s sugar’s texture and sweetness if different from regular sugar, I’m not sure whether it will work out. Hi maria, reading thru the comments..i felt ur such a generous person! clairification…what milk dyo suggest to use? I’ve used regular cow’s milk for this recipe. I do hope your son likes this cake. Advanced b’day wishes to your son! Wish you a Merry Christmas! Hey…good recipie.it taste amazing…but my one concern was I find the cake was soaked in oil…what should we do? Thank you. I’m sorry dear, I’m not sure why it happened like that :( Did you bake it as cake or cupcake? I hope you mixed the batter nicely. This is probably the best chocolate cake I have ever made! And I have attempted baking for a while now but my my was this a success!!! So moist! Thanks a lot for sharing. I didn’t have cream in the house so I did a butter icing instead. Thank you so much for your wonderful feedback :) I’m glad that you liked the recipe. Thanks for sharing the pic too, it looks nice! I’ve been using this recipe for probably over 12 years ( though I have always called it “deep dark chocolate cake”), but I had forgotten all about it for the last few years. Just made it again yesterday, and it truly is the perfect chocolate cake. This recipe has never failed me. the best chocolate cake recipe ever! my family loves it! baked it for the Children’s Home. it was gone within the first few minutes. Many many thanks Maria. you’ve just made me a happy baker! :) greetings from Singapore! Thank you so much for sharing your feedback here :) Great to know that the cake was a hit at your place! Thank you very much for your wonderful comment :) I’m really happy that the cake came out well for you. Great to know that your friends enjoyed it too..
Yours is my go-to recipe time & time again.It turns out simply delish everytime even though the baking time varied…mine took almost 45 minutes!Thank you for sharing :-). You are welcome Priya :) Great to know this is your go to recipe! yeah, the baking time varies for each oven.. This is also anther winner!!! Thanks???? This is also another winner!! Thanks!!???? Hi, I tried this once and it was awesome everyone loved it. But now some family members are requesting me to bake a vegetarian moist chocolate cake. Could you suggest me how do I alter it? Thank you very much. Thanks Nithya! Good to know that you liked this recipe. I assume by vegetarian you mean an eggless cake? I havent tried this without eggs, so I’m not sure how it works. However, I’ve posted an eggless choc cake recipe. This recipe also gives a very moist cake. Hope you get to try it. I make it in either cupcake form or cake form for all social events and sometimes just because I can. I added a salted caramel icing last time and it was a big hit. This cake never gets old and everyone loves it. Thank you so much :) Really happy to know that you bake this one regularly. Salted caramel icing sounds delish! Thank you so much :) Good to know that you liked the cake recipe. Thanks for sharing the pic too..
Btw, I noticed that your family name is Pachikara. My sis in law’s mother’ s family name is also the same. They are based in Thodupuzha.. Awesome recipe. The last 2 chocolate cakes I made (different recipes) were too dry but this choc cake was moist, luscious and easy. A winner. This is my new go to option for birthday cakes. Thanks Mariam :) Really good to know that you liked the recipe. Sometimes the cake may sink, if the qty of batter is too much, try pouring less qty of batter next time. Hope it helps..
My experience says that u must have opened the oven door in between baking … that’s the reason y ur cake sank .hope that answers the question. Am gonna try dis recipe. Its so tempting :) Can I use any other oil instead of sunflower oil like coconut oil. I havent tried with coconut oil, so I’m not sure. You can use any other veg oil like corn oil instead of sunflower oil. Hi may i know 1.5cups of milk equates to how many mililitre (ml)? You are welcome :) Very happy to know that this recipe worked out for you. Thanks a lot for the comment! Hi Maria.. I made this cake and it came out nice.. Thank you for the recipe. I just wanted to clear one doubt. You have mentioned one cup, 2 cups.. What is the size of the cup? Thanks :) I use the std measuring cups for baking and I guess I cup is equivalent to 240 ml. The first time I tried this recipe, I used icing sugar thinking it’s the same as caster sugar.the cake still was ok. Next time I used granulated sugar and I nailed it. My husband, who’s not so much a chocolate fan, loved it and couldn’t stop eating it. This is going to be my go-to recipe now. Very precise recipe and the substitutions are also exact. Thank you very much for your comment :) I’m happy to know that it came out well for you. Caster sugar is not powdered, it’s very fine granules. Hi there, I tried this recipe for this Valentines day and I am really impressed with the cake,considering my epic chocolate cake failures in the past,all thanks to ur recipe.thanks mariachechi. Thank you so much :) Really happy to know that the recipe worked out well for you. Your site is very user friendly and you appear to thoroughly enjoy doing what you do because it translates to your followers. Have tried out some of the dishes and they turned out delicious. Thank you. Thank you so much for taking time to leave a comment here :) Good to know that you find the site user friendly. I’m happy that the recipes tried from here worked for you. Sorry to hear that the cake didnt turn out well. From your comment, I feel that it happened because the batter wasnt mixed well. Make sure all the ingredients are incorporated and the batter is mixed well, without any strains. Also, try tapping the cake tin on the counter for a few times, before placing it in the oven. Hope it comes out perfect next time..
With slight alterations I made this beautiful chocolate cake with ganache and it was yum yum ? Thanks Shilpa :) Glad you liked the recipe. I’m Regina from Malaysia, glad to find your blog, very nice and delicious recipes :) ..I tried your Ultra moist chocolate cake for my uncle’s birthday, seriously it was delicious and the taste was just perfect with less sugar..it was not too sweet..would like to know if this can be made as vege cake, replace the egg with buttermilk? if yes, what’s the measurement please. Just wanted to know if this recipe can be made with out egg n if yes what would the substitute for egg be . Hi Maria! Ive tried this recipe too many times now and enjoy it each time! I was wondering can this recipe be trippled or quadraple? Making 100 cupcakes for this coming weekend. Made it and came out very well…. Just loving it…. yummy? Thanks Preethi :) Glad you liked it. My gosh… The cake was amazing!!!! Thanks!! So does the moistness come from using a lot of butter? Hi Maria, I have tried the cake,and I think it has turned oout well. I havent removed it from the baking tray though in the fear of breaking it as it looks moist. I baked it on sunday morning(today is monday) and we are planning for a surprise cake cutting for our mom’s birthday tomorrow(tuesday evening). So the cake will be 2 days old by then. I have just stored it in a air tight container along with the baking tray. WIll it last fresh till tomorrow night. I am afraid!! or do i need to keep it in the fridge, if so how should I thaw it? planning to put the Ganashe over it on tuesday eevning, few hours before the cake cutting. Should I keep it in the fridge after pouring the Ganashe? Kindly advice. Expecting a reply soon!! Hey Maria thanks for such an awesome recipe. This is what I always wanted ?it looks super delicious and yummilicious. Can I bake this in a 9 inch round baking pan as I don’t have a loaf pan. Please reply as I am planning to prepare it as soon as possible. I am looking at this recipe and the picture looks amazing. I have to bake a cake for a 1st birthday party, and I was wondering if this cake would work if I wanted to decorate it? This looks so tempting! Must try making this! Thanks for the recipe! Thank you very much :) Hope you get to bake this soon! Can we bake this is in pressure cooker ? Hi Maria can you pls let me know how much is 1cup in grams and when you take flour should we level it?